Are you one of the candidates who is searching for the Police Jobs 2019? if your answer is yes then you are at the right place. Now in this article, we are providing all the latest and upcoming Police Job Openings 2019. The aspirants who are hunting for the jobs on the various websites can stop now. The contenders who want to serve the country can find out all type of Police Jobs in India in this article. Candidates who are interested and eligible can apply for the Indian Police Recruitment 2019. In the below of this article, we are providing the Police Vacancies 2019 across India. Candidates can apply for various vacancies such as Constable, Head Constable, Sub Inspector, Assistant Sub Inspector, Home Guard, Warder, Assistant Motor Vehicle Inspector, Jail Prahari, Dog Handlers etc. Check the latest Police Jobs 2019 on this article. vacancy 2019, then you are in right place. All the Police Jobs 2019 that are released by different State Government Jobs are included in this article. By checking this post regularly, candidates will know about the Latest Police Vacancy in India 2019. Nowadays a large number of candidates are passionate towards Police Jobs. Those who want to protect the public and serve the country can refer this page for the upcoming Police Job Openings 2019. Per a year the Indian Police Department is recruiting the thousands of candidates for various positions. The main aim of the police is to maintain the law and orders in the country. Contenders who are striving hard to settle down in the Government Jobs can apply for the Police Job Vacancies 2019. For the sake of the candidates, we are providing the various Police openings. Every year there will be the number of openings in Andhra Pradesh, Rajasthan, Uttar Pradesh, Bihar, Madhya Pradesh, Maharashtra, and Tamil Nadu. In Punjab, Kerala, Himachal Pradesh, Haryana, Sikkim, and North-eastern state the recruitment openings will be less. The Indian Police Service is one of the All India Services of Government Of India. The Indian Police Service is formed in the established in the year 1948. Along with the IAS and IFos, the IPS is a cadre. These all the three services work under the Union Government and Individual State. For the research and development of police force in India, the Bureau of Police Research and Development is responsible. The various departments under the Indian Police are ready to hire the dynamic candidates for the Police Officers in India. The candidates who are applying have to complete the 10+2, Graduation and Post Graduation from the recognized university or Institute. For each position, the educational qualification will change. So we suggest the aspirants check the eligibility details before applying for Police Jobs 2019. Getting the Job in the Indian Police Department is not such easy. In this competitive world, the aspirants who are with the physically fit can apply for the Police Job Vacancies. On our website, the candidates can check the vacancies under the Central Armed Police Forces (CAPF), Central Investigation and Intelligence Institutions. And also if any of the State announced the police vacancies can get the job openings in various agencies like Traffic Police, District, Metropolitan police, Criminal Investigation Department (CB-CID), Division wise Police Department, State Armed Police Forces. Center or individual state will announce the massive number of Police Job Openings 2019 in every month. The candidates who are still waiting for the Indian Police Recruitments 2019 can go thorough this page. Among all the jobs the Police Job is most responsible and difficult job. The main responsibility of the Police Officer is to reduce the Crime rate in the country. 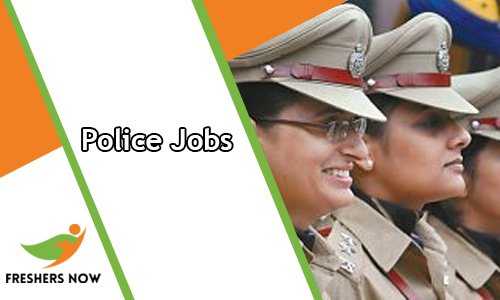 The citizens who belong to the Indian National can discover the latest and Upcoming Police Jobs 2019. Applicants who are willing to apply for the Police Jobs 2019 have to check the eligibility criteria. The candidate’s minimum age should be 18. There is no upper age limit for the aspirants who are applying for the Police Jobs. the Police Recruitment is done in three stages. The candidates have to give the Preliminary Exam, Mains Exam, and Personal Interview round those who applied for the Police Jobs 2019. To prepare well for the examination the candidates can check the Syllabus and Placement Papers from our website. A large number of candidates are recruiting under the various departments which we have given below of this page. Apart from the normal rounds of the selection process, the aspirants have to clear the Physical Test and Medical Test first. Our team of Freshers Now update this page from time to time with the latest Police Jobs Openings. Defence Central Agencies: Indo Tibetan Border Police (ITBP)/ State police/ Central Police/ Central Armed Police Force (CAPF)/ Border Security Force (BSF)/ Central Reserve Police Force (CRPF)/ Central Industrial Security Force (CISF)/ Sashastra Seema Bal (SSB). Central Investigation and Intelligence Institutions: Directorate of Revenue Intelligence, National Investigation Agency (NIA), Central Bureau of Investigations (CBI), Indian Income-tax Department, National Crime Records Bureau (NCRB), Narcotics Control Bureau (NCB), Bureau of Police Research & Development (BPR&D). There are a hand full of opportunities for the candidates of various categories. Usually, the SC/ ST category aspirants have the number of Police Job Openings 2019 when compared to General and OBC candidates. The candidates can undoubtedly apply for the Police Jobs 2019 who are intended to serve the nation. On this page, we have created the table with the latest openings. The aspirants who want to be the first one for applying for the Police Jobs 2019 refer this page completely. Before going to the apply the aspirants have to check the eligibility once. We are sure that the Indian Police Recruitments equipped on this page will be very helpful for the candidates. Both the Male and Female aspirants can across India can check and apply for the openings. Contenders can visit the official website freshersnow.com for the instant related to the latest Police Jobs 2019.